Yesterday I did a little pruning to our cannas. 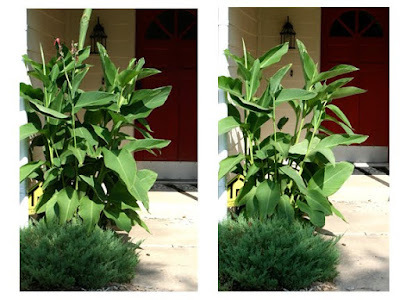 I wanted to add a little height near our front door so I transplanted three canas. It is amazing how fast they can grow when they are in a happy place. The Remington Man is not so excited about them; he thinks someone can hide there. I told him since we don't use our front door I'm not that concerned. I cut down 6 stalks can you even tell?